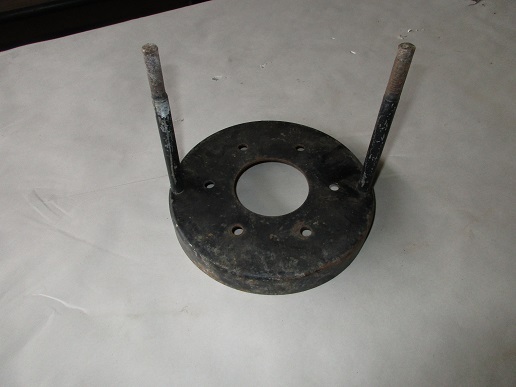 Model T Ford Forum: Small rear brake drum with two studs sticking out,what for? Small rear brake drum with two studs sticking out,what for? 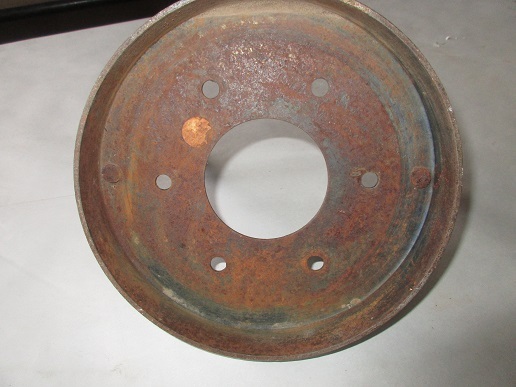 Model T Ford Forum: Forum 2018: Small rear brake drum with two studs sticking out,what for? This drum shows some usage but very little if any wear so why these studs were peened into it is a mystery to me. They did a pretty nice job of it. The outside ends look like stripped threads but it's probably a rough lathing job to reduce the size a bit. Any ideas? It could very well be for some use having nothing to do with a Model T or any other car. Might not be any thing more than a home made stand or holder for some forgotten purpose. Connection for auxiliary drive from rear wheel, pulley, dual wheel, ice cream churn, pump jack, etc,,,,,, ? Rich, that looks like the drum replaced the driving end of a sickle-bar mower, pitman arm attached. ?? Lots of Model T bits and pieces ended up either repairing or becoming farm implements. As the 40 acre farmers went the way of the buffalo in the 60s most farm-steads were good places to mine for T parts. I miss the old days ! It's another T part that was made into a what's it. And there has been a bunch. Like Rich B. It's a reminder of what you find at farm auctions thru the 80's. Lots of T remains, pieces, and parts altered for no telling what. Early UHF TV rabbit ears! A component of a failed attempt at a two pronged confabulator, possibly from the Kalamity scrap pile. I would of used those long studs to attach a large flat pulley to the rear wheel of the T so I could run my gristmill and possibly my saw mill. Anybody interested in this thing for their "what's it"wall? Or it's a good,straight drum with zero pitting,the rods could be ground off,maybe a little gas or tig welding around what was left and use it. Open for offers.